Evoke an Italian summer any time with this simple, delicious dessert. I first read it more than 30 years ago, and have followed Mrs David's advice ever since, any time peaches and white wine appear in front of me, whether “after luncheon” or not. This recipe is just an extension of that simple, elegant premise. Here, the peaches are poached with some Marsala, peeled, then left to souse in a reduced syrup made from the poaching liquid. The Marsala I keep is dry – secco – so I amp up the sweetness with a bit of sugar. If you use semisecco or sweet Marsala, you might not want to use as much. Don’t use Marsala all’uovo as it has, as its name suggests, eggs added to it, and you'll end up with a cloudy syrup. Put the Marsala, water, sugar and cinnamon stick in a saucepan, swirling until the sugar dissolves. Place over medium heat, bring up to a boil and let it bubble away for about a minute or two until the cinnamon becomes fragrant, then lower the heat to a very gentle simmer. Halve the peaches and remove the stones. Use a spoon to lower the peaches, cut side down, into the liquid. Poach them for 3 minutes before gently turning them over. After 3 minutes, test with the point of a knife to check that they are tender; if not, just give them a little more time. Remove the peaches with a slotted spoon and transfer them to a shallow dish that can contain them in a single layer. When they become cool enough for you to handle, slip the skins off. Bring the Marsala back up to rapid boil and reduce it until you have about ⅓ cup syrupy liquid remaining. Let it cool off in the pan before pouring over the peaches. Cover the dish with cling film and refrigerate until chilled, and up to 24 hours. 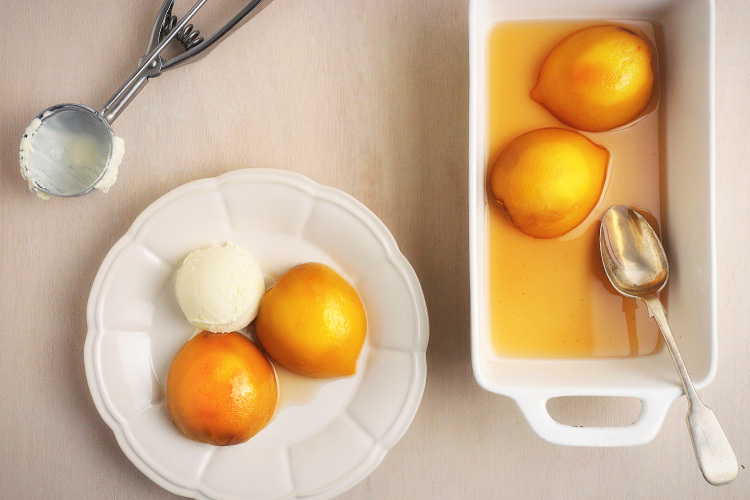 Serve the peaches with some of the syrup spooned over and a scoop of good vanilla ice cream.